It was a long time ago when NForce4 was initially released - in fact, it was back on October 19th. It seemed as if we were going to be forever plagued by false starts in getting our own NForce4 review up, after initial problems with the reference board, and then the replacement board that we recieved, and then finding that our first SLI motherboard was also dysfunctional. All in all, we had a pretty terrible start with NForce4. This week we're having a long-awaited look at NVIDIA's SLI - we got there eventually! While most of the emphasis on SLI is focused around the extreme graphics performance that can be achieved with the right video cards. It is important to remember that a crucial part of the SLI platform is of course the motherboard - without a good, solid motherboard, you cannot experience the blistering gaming experience that you can get from an SLI platform. Today, we are evaluating motherboards from the four motherboard manufacturers that have NForce4 SLI motherboards for AMD Athlon 64 processors that have passed NVIDIA's SLI certification programme. Apart from the obvious PCI-Express capabilities that come with the NForce4 chipset, there are many features that have been added in to the fire to position NVIDIA's PCI-Express chipset above the competition. They say a picture is worth a thousand words, so here's a picture with some extra words just to make sure. NForce4 has increased the number of possible USB 2.0 ports that can be supported by the chipset. Whilst the NForce3 chipset supported up to eight USB 2.0 ports, while NForce4 increases that up to a nice round number of ten. 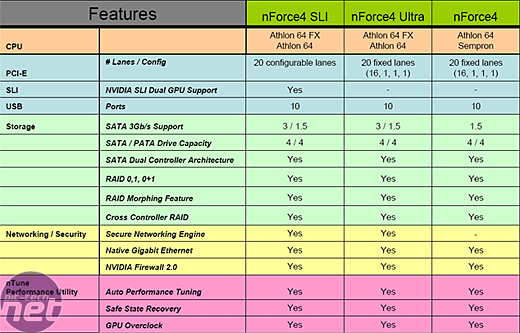 We've already mentioned PCI-Express support - all three implementations of the chipset feature 20 lanes, but only the NForce4 SLI chipset is capable of configuring those lanes depending on how many video cards you are using in the motherboard. We will have a look at how each of the motherboard manufacturers choose to implement the PCI-Express lane configuration over the coming pages.